1. Michelangelo‘s David, simply the most magnificent sculpture I have ever seen but book ahead to avoid long lines at the Accademia Gallery. 2. Take your lover to the Ponte Vecchio and place a lock on the ironwork and then throw the key into the Arno River to seal your love. 3. 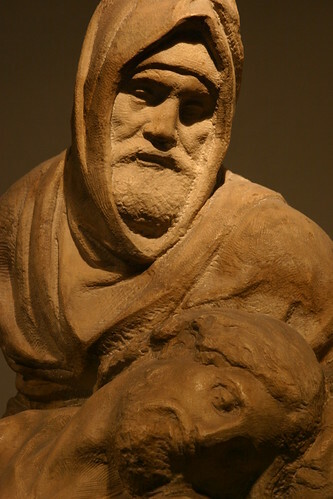 Michelangelo‘s The Deposition, is believed to contain a self-portrait of the aging Master as Nicodemus. Michelangelo smashed it after fault in the marble caused a leg to break off. A servant sold the pieces and the buyer reconstructed this unfinished masterpiece. 4. Shop for an Italian leather jacket at the San Lorenzo Market or a exquisite gold necklace on the Ponte Vecchio. 5. Sit on the steps opposite the Uffizi Gallery and enjoy a gelato while the human experience unfolds in front of you.